Beaver Falls, Pa. – The Geneva College Golden Tornadoes hosted the Westminster College Titans on Black & Gold Pack the Gym Night on Wednesday, February 15. Geneva’s early 3-2 didn’t last as Westminster held the lead to the end after the first minute of play, handing the Golden Tornadoes a 72-64 loss. The loss moves Geneva’s overall record to 9-15, 6-11 in the Presidents’ Athletic Conference (PAC). The Titans took the early lead 15-5 by 14:52. Geneva didn’t let the gap linger outscoring Westminster 10 points to three bringing the score to 18-15 at 11:09. Ethan Moose’s (New Castle, PA/Neshannock) pair of free throws brought the game to a tight 18-17 at 9:39. Westminster’s nine-point run left Geneva behind 27-17 at 5:40 in the first half. David Oliver (Sewickley, PA/Quaker Valley) finally broke the ice with a good three-pointer at 1:40 moving the board to 35-26. Geneva entered the second half of play down 36-26. Moose targeted the basket scoring seven points in the first five minutes of the second half. Meanwhile, on the other end of the court, Matt Dragan (Latrobe, PA/Greater Latrobe) protected the paint helping Geneva chip away at the Titans lead. Joey Jou’s (Miami, FL/Westwood Christian) layup moved the game within a possession 47-45 at 11:55. Jimmy Leichliter (Connellsville, PA/ Connellsville) tallied a steal and layup, Geneva still behind at 59-57 with 3:52 remaining in regulation. Geneva’s efforts fell short splitting the season series with Westminster. Leichliter lead the team’s scoring with 19 points while adding seven rebounds. Moose also posted a double figure game with 18 points. He added six rebounds to the night. Oliver was tabbed as Geneva’s top rebounder for the night with nine. 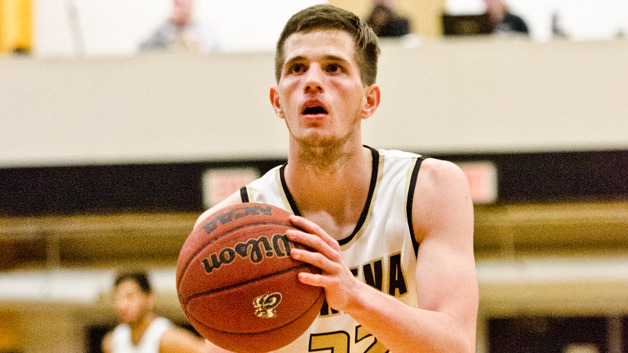 On Saturday, February 18 the Golden Tornadoes will close out the regular season hosting Waynesburg at 7:30 p.m. during the school’s White Out Night. Before the game, the program will honor its’ three seniors: Chaese Vaudrin, Zach Burns and Aaron Channing.